Counter Surveillance Detection – Who Could Be Watching You? Many people only find out that someone has been watching them when they accidently stumble across a hidden camera. Once discovered, it is important to hire a professional to undertake counter surveillance detection and ensure that all devices are found and removed. However, this won’t answer the question as to who had them put there in the first place. Finding out who placed the bugs or cameras in your home is important for a number of reasons. Firstly, and most importantly, it is to determine whether you or your family are at risk. If you are being watched by someone for voyeuristic reasons, then the bug detection and removal should remove the problem. Of course, if you are in rent accommodation, you may want to have a strong word with the landlord or even consider moving. If, however, it is an ex-partner then the situation may be more complex and your safety could potentially be at risk, depending on how they react to your counter surveillance moves. Of course, your home may also be bugged for personal or professional gain as well. Individuals may find themselves the subject of surveillance in the hope that they will give away work-related secrets or provide entry into buildings or even computer systems. If this is even potentially the case, then your place of work needs to be informed along with the authorities. These are just a few of the types of people who may want to put you under surveillance for one reason or another. One common thread, however, is that you can never be too careful with your privacy. The first step to ensuring your privacy must be to employ counter surveillance detection. The most effective way to do this is through Advanced Sweeping. We can provide you with the expertise and confidentiality you require. 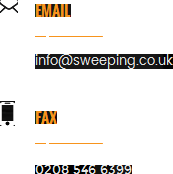 Email us on info@sweeping.co.uk; remember not to do it from a computer that may be compromised. You will find more tips on our website, http://sweeping.co.uk/.